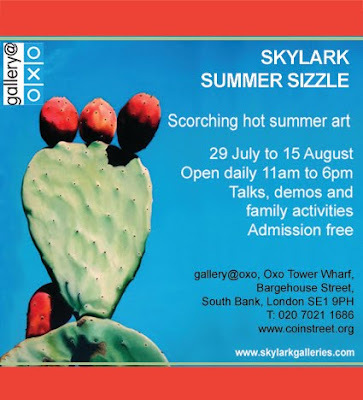 I'm showing in Skylark's summer group show at oxo@gallery on London's South Bank, which runs from Thursday 29 July to Sunday 15 August. The gallery, on the waterside between Blackfriars Bridge and the National Theatre, is open from 11am-6pm, seven days a week. Hello, found your blog via Stumbleupon/urbansketchers. Seeing your drawings makes me homesick for London, where I was born and bred, have fond memories of walking past the Oxo Tower on the way home to Wapping, now sadly exiled in Worcs. Knew Stoke Newington well too! Anyway, love your work, the vibrancy, fluidity. Hope the show goes well. p.s. hope you don't mind me adding my website, if you would like to take a look, any feedback would be most welcome. Thank you. Thanks, Angela. Glad you found it. I'll have a look at your site. Good luck to you, too.